Between 1896 and 1916 two very effective agitators combined to ‘sow the seeds of discontent’ among the working class, not just in Dublin, but in urban areas throughout the country, and abroad. The first, James Connolly, arrived in Dublin in 1896 and, very shortly after, founded the Irish Socialist Republican Party. The other, Jim Larkin, arrived from Liverpool in 1907 as organiser for the National Union of Dock Labour, and the following year founded the Irish Transport and General Workers Union. Both were the sons of Irish emigrants from the immediate post-famine period. Each of them had his own view as to how the working class could raise themselves up, both were strong willed, yet they were able to combine at critical moments when the opportunity presented itself to improve the position of the working-class. They were by no means the first agitators in the land. But they were undoubtedly among the most effective, and carried out their work during a critically important period in terms of potential for change. On Connolly’s arrival in 1896, he immediately threw himself into the task of establishing his tiny party, relying on public open-air meetings, usually in Beresford Place, by pamphleteering, and later through the pages of his own newspaper The Workers Republic, and in various advanced-nationalist organs of the press. He involved himself in the preparations for the centenary commemorations of the 1798 Rising shortly after his arrival with the establishment of the ‘Rank and File ‘98 Club. He also involved himself in opposition to the Boer War, using the campaign to illustrate the nature of colonialism allied to capitalism. These activities brought him into contact with many of the leading political personalities of the day, but more importantly established his credentials with the social class whose cause he championed. While this did not bring electoral success for his party, it was to pay off later. In 1903, disillusioned with the ineffectiveness of the ISRP and what he saw as the poor prospects of establishing a viable socialist base in Ireland, Connolly left for America where he continued his agitation on behalf of workers and eventually found employment organising on behalf of the International Workers of the World. He further established himself as a socialist intellectual of international stature during this seven-year exile. While Connolly was away, he still contributed to the debates of the day in Ireland through the medium of the press, and during this time continued to develop his political, social and economic arguments, culminating in the publication, following his return to Ireland, of his most important work – Labour in Irish History – in 1910. By the time Connolly returned to Ireland, Jim Larkin had also established his position as a labour leader of considerable stature. The formation of the ITGWU had created a union which was free from cross-channel control. It developed a set of tools by which workers could pressurise the employers into negotiating better terms; lightening strikes, sympathetic strikes, ‘flying pickets’ and so on. In all this it helped to radicalise the working class and to create a sense of solidarity among them, which is not to deny that, given the economic conditions of the day, there was not a ready supply of ‘blacklegs’ or ‘scabs’ available to the employers in the attempt to break the effectiveness of the union. But this was a militant union, and its members were not afraid to stand their ground. With the union growing in strength, Connolly and Larkin also took a prominent role in the foundation of the Irish Labour Party in 1912. Workers flocked to join the ITGWU. Between 1910, when Connolly and Larkin joined forces, and 1912, union membership grew from 4,000 to 10,000. Irish employers who had up to then dictated terms of employment with impunity recognised the threat to their power and profits and began to organise against trade unionism. In this, they had the backing of the Catholic church, all of the leading newspapers, and the British administration in Ireland, in other words, the political class. The conflict between the union and the employers increased, with conditions imposed on workers that they not join or that they renounce existing membership of the ITGWU. When tram workers employed by William Martin Murphy’s Dublin United Tramway Company walked off the job on the 26th of August 1913, during the highly popular Dublin Horse Show, 400 Dublin employers retaliated by locking out over 20,000 men and women workers, and so the Dublin lock-out began. The lock-out, which was led on the employer’s side by William Martin Murphy, who besides being a wealthy industrialist was owner of the influential Irish Independent newspaper, saw acts of extreme brutality inflicted by the police on civilians. This resulted in the formation of the Irish Citizen Army by Larkin, Connolly and others, an idea brought back by Connolly from his time as an organiser with the IWW in the US where a Citizens’ Army was a necessary protection for striking workers who were regularly targeted for extreme violence, including murder, by gangs of thugs hired by employers. First conceived to provide protection to strikers, the Irish Citizens Army developed quickly into an armed and well drilled force, albeit small in numbers. Liberty Hall, the headquarters of the ITGWU, became the centre of activity for the striking workers and their families. As the Employers Federation tightened its grip on the city, blocking food supplies and other essentials of life from entering the city, soup kitchens were set up in Liberty Hall with Countess Markievicz, Helena Moloney and other radical women organising the distribution of limited amounts of food to the destitute workers’ families. Dr Kathleen Lynn set up first aid facilities in Liberty Hall to treat workers injured in action on the picket-line and also to alleviate sicknesses brought on through starvation, especially affecting children. Over the course of the lock-out a union official died in police custody following torture, two workers were killed on the streets by police, and another, a woman, was shot dead by a strike-breaker. Hundreds of strikers were injured, mainly in police baton charges. Lives were lost too in tenements in the poorest parts of Dublin as women and children in particular succumbed to starvation, disease and cold during that winter. The lock-out petered to an inconclusive ending after seven months, with workers drifting back to work out of necessity and many Dublin businesses fatally wounded by the actions of their owners and forced to close. The ITGWU had though established the right of workers to organise in trade unions and the principle of workers’ solidarity as paramount in the struggle against oppression and exploitation. Liberty Hall had been established as an important centre of resistance and as an excellent training ground for another battle that would soon be fought. The workers involved in the lock-out had garnered support from a wide variety of sources – feminists, advanced nationalists, artists and intellectuals, and republicans. The Irish Citizen Army had been established as a military force with James Connolly in a pivotal position, and a group of men and women in leadership roles who would be of crucial importance later. Connolly assumed command of the Citizen Army in 1914 following Larkin’s departure for America to raise funds, where he would remain until 1923 having spent a number of years in prison for criminal anarchy. Connolly was a multi-tasker. Apart from the Irish Citizen Army he was acting General Secretary of the ITGWU. He was a newspaper publisher and journalist, first under the banner of The Irish Worker and when that paper was suppressed reviving his own paper, The Workers Republic, in which he wrote most of the copy. He was a leader of the anti-conscription campaign in the lead-up and during the First World War. He was forging alliances with various elements working to create a revolution. He was developing a strategy and tactics for urban guerilla warfare that drew on research into other revolutionary events, and that would substantially form the basis for the military campaign during Easter Week 1916 and would serve as a model to be used during the War of Independence and in other revolutions in other parts of the world. In January 1916, after a period in which Connolly had baited the Volunteer leadership on their timidity in not seizing the opportunity of British involvement in a major war to strike for Irish freedom, he disappeared for three days. His own people in Liberty Hall believed he had either been kidnapped by the Volunteers or lifted by the police and was being held in Dublin Castle. He was in fact mainly in Eamon Ceannt’s house with the leaders of the Irish Republican Brotherhood (IRB). While some speculate that this period was spent in attempting to dissuade Connolly from taking premature action with the Citizen Army, as he had indicated he would, it is more likely that the discussions focussed on what sort of republic would be the endgame of any revolutionary action. What we can safely assume, knowing Connolly’s character and his strong convictions, is that he emerged from this series of discussions fully committed to the alliance of the IRB, Irish Volunteers and the Irish Citizen Army, with a date for action determined, and with the template for the new Irish Republic nailed down. What republic did Connolly want? The Workers’ Republic. 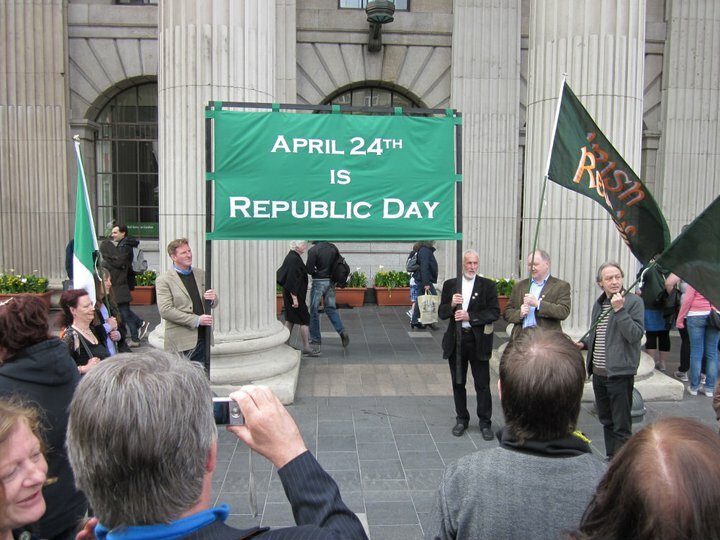 What did the Proclamation lay out as the model of republic? A socialist republic – with the potential for the citizens of a free Ireland to take that to the next level, the Workers’ Republic. Would Connolly have settled for less? No! Did the other leaders with whom he had spent three days walk away from the discussions? No! All seven signed their names to it, knowing that they would likely die for that action. If a revolution can have a head office, then Liberty Hall was that – for socialists and republicans alike. When the flag of the Irish Republic was raised in Dublin for the first time it was over Liberty Hall, a week before it was raised over the GPO on the 24th of April 1916. It was in Liberty Hall that the Proclamation was printed, and it was from Liberty Hall that all orders went out immediately prior to the revolution, and from Liberty Hall that the GPO garrison marched to light the fire of revolution. The central importance of Liberty Hall to the Irish revolution – from the experience of the 1913 lock-out, to the pressure applied by Connolly and the Citizen Army for revolution, to the planning and the execution of the revolution, must be recognised. The fruit of all of that was to be the socialist Irish Republic, but it was the rotten fruit of counter-revolution that would ultimately be served up to the Irish people in 1922, a fruit that they are still forced to eat today. An oft-repeated criticism of Connolly, principally by those who claim to be ‘pure’ socialists, is that he in some way let the socialist side down in 1916 by aligning himself and his army with nationalists. The lie is given to that in the text of the Proclamation of the Irish Republic for which the leadership and rank-and-file of the revolutionary force in 1916 were prepared to lay down their lives to achieve – a socialist republic. Paragraph four of the Proclamation could have been written by no-one other than James Connolly, and that is the key paragraph. And if he did align himself with nationalists, they were nationalists who were republican in their ideology. And what is a republican? According to Connolly himself, to be a republican is to be a socialist and to be a socialist is to be a republican. But perhaps not a ‘pure’ enough socialist for some, the measure of whose opinion should be their own achievements, or lack thereof. Perhaps these egotistical ‘pure’ socialists would point to a single instance of a ‘pure’ revolution in history. They cannot, for none exist. Connolly himself had written in ‘Erin’s Hope’ as far back as 1897 – “we will, as the true revolutionist should ever do, have called into action on our side the entire sum of all the forces and factors of social and political discontent. By the use of the revolutionary ballot we will have made the very air of Ireland as laden with ‘treason’, as fully charged with the spirit of revolt, as it is to-day with the cant of compromise and the mortal sin of flunkeyism; and thus we will have laid a substantial groundwork for more effective action in the future…”. “But he showed himself to be a nationalist”, the internationalists cry. The fools! Connolly, an internationalist to the core, pointed out that you cannot be one, the inter-nationalist, without being the other, the nationalist. Nationalism is neither an automatically good or bad thing. If the Nation – the collective of citizens – operates to a set of benign, progressive and non-insular ideas and values then it is obviously a good thing, and the values in the Proclamation of the Irish Republic have these good attributes. Connolly wished the Irish Republic would act as a ‘beacon of hope‘ to the oppressed people of the world, in other words that it would provide an example for them to emulate as they wished. What did Connolly have to say in Erin’s Hope 19 years before the revolution? “The interests of Labour all the world over are identical, it is true, but it is also true that each country had better work out its own salvation on the lines most congenial to its own people.” The ‘pure’ socialists on the other hand, adopt the position of the imperialist in seeking to impose a universal solution regardless of local cultural norms and nuances – another form of tyranny. It is a pity that sectarian elements on the left would not study Connolly’s words and try to understand what the true revolutionist needs to do. And given that the parliamentary Irish Labour Party has aligned itself with the forces of the right it is even more of a pity that the rank-and-file members of the Irish Labour Party, in the centenary year of the party founded by Connolly and Larkin, would not familiarise themselves with those same words and understand where their rightful place should be – firmly on the left, not in the middle, and certainly not on the right. What was it that Oscar Wilde wrote? True one hundred years ago, just as true today. Agitators are absolutely necessary!